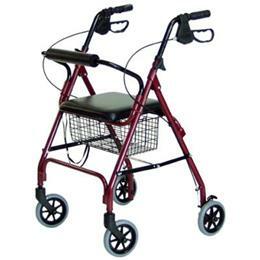 The Lumex Walkabout four-wheel Imperial (Bariatric) is ideal for larger individuals. 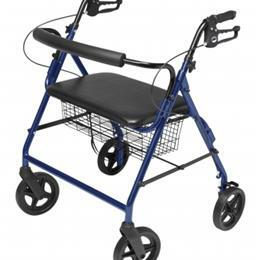 This rollator offerse a comfortable, lightweight, and affordable solution to mobility. 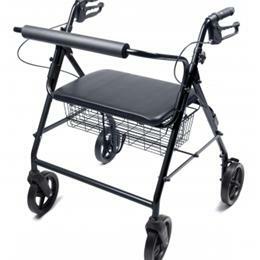 Designed with an aluminum frame, the rollator can support up to 500 lbs. yet only weighs 20 lbs. In addition to its light weight, the Walkabout folds quickly and easily into a compact unit to simplify storage and transport. The chair is with a straight backbar design, or a contoured back bar design, both available in three attractive colors. Now with added rear refl ectors that increase visibility at night! For additional product information, including a more detailed picture, color options, and further specifications, click on the Product Detail PDF located below, under the Additional Resources tab. Overall depth (Straight -- Contoured): 27.5" -- 30"
Handle height adjustment range: 34" - 39"